When missionary JV Martin penned the words to “A Light on the Cross” in 1923, Japan had just experienced its darkest day. The Great Tokyo earthquake of September 1st had claimed the lives of over 142,000 people. Countless more had lost their homes and livelihood. In the darkness of the first night, the flickering flames of candles in the hands of survivors seemed to him to form the shape of a cross piercing the blackness around and despair within. On March 11, 2011, 88 years later, the 9.1 magnitude earthquake, tsunami and nuclear crisis “triple tragedy” threw Japan into black despair again. The ensuing energy crisis plunged Japan into a literal darkness that seemed symbolic of the bleak mood of survivors. Yet for those who saw with eyes of faith, the cross shone ever brightly, a beacon of hope in the tragedy around. God always comes and stays with his people in their darkest moments. PDF digital version is also available. Details below. Small Group Leaders guide now available here. 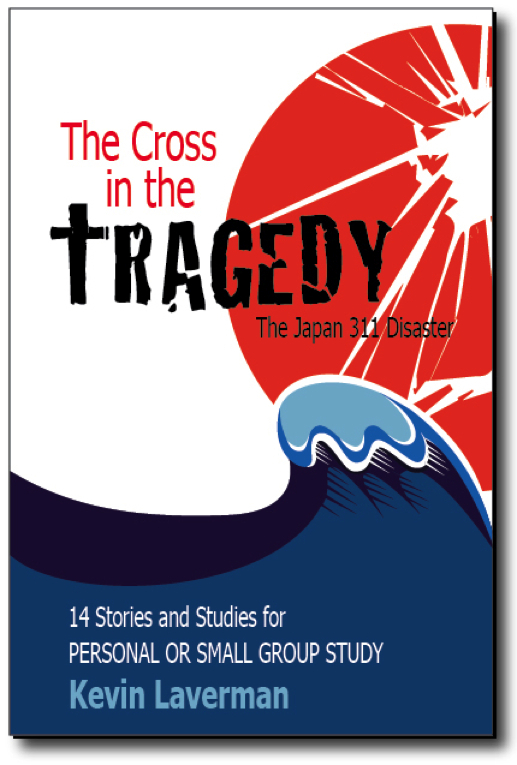 Any proceeds from the sale of this book will go toward the ongoing relief work in northern Japan. Our desire with this resource is only to advance the kingdom of God in Japan. Please click the Paypal button at right to enter your address and shipping information securely online. If you wish to order without using Paypal, please email us with your name, address, and quantity desired (click email icon in footer below). A digital version of this book (PDF file) can be sent to you free of charge with any order. If you only need the digital or print version, please make that selection in the drop-down menu at right. Please donate $5 per copy. It is my conviction that nothing is wasted by God. He often speaks around the edges of hardship to reveal himself, give spiritual perspective, and move us forward toward new hope. This book represents just a bit of how, in the course of processing the 311 tragedy, God gave me new glimpses into the gospel message and the Christian life that empowered me during relief work. more of the context and need for mission work in Japan post-311, and that it will lead you to remember the Japanese people in prayer at this critical time in the nation’s history. Now is the time to be re-energized in a mission vision for Japan! The harvest fields are truly ripe. Pray for harvest workers.